No items have been viewed yet! 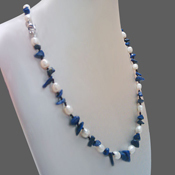 Lapis and white rice freshwater pearl necklace is as versatile as a necklace can be. Wear it for business or pleasure, day or night. 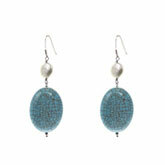 White pearls and turquoise dangle in our lovely freshwater pearl earrings. Silver ear wire. 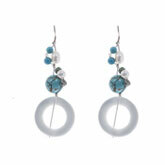 White pearls and turquoise are serendipitously suspended above round white hoops in our freshwater pearl dangles. Silver ear wire. 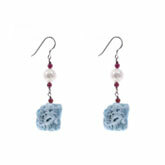 Colorful blue ore and garnet and white pearls create a playful combination in our freshwater pearl dangle earrings. Silver ear wire. 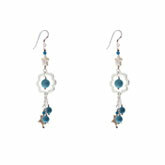 Our delicate dangles feature star pearls added to bright blue turquoise. Silver accents complete the look. Silver ear wire. 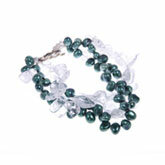 Our stylish bracelet with rectangle and round pearls combines with turquoise for a modern look. 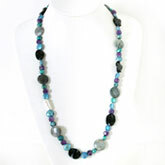 Neon blue pearls and a toggle clasp complete the look. This stunning metallic turquoise blue freshwater pearl and "cracked" crystal multi-strand bracelet is the stuff dreams are made of! 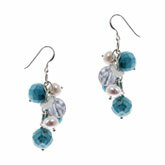 Icy crystals contrast beautifully with the neon-blue pearls. Gorgeous! 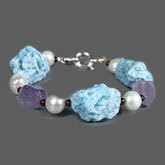 A lovely 3 strand bracelet incorporating turquoise, icy crystal, gleaming keishi and gorgeous blue pearls. Silver closure. 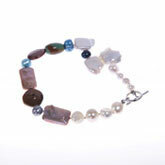 A fabulous 3 strand bracelet with blue and white pearls, smoky quartz and agate. Very gemmy indeed! One of our more dramatic looks, this 8" freshwater pearl bracelet adds the luxury of white round pearls with the color of green aventurine. Simply stunning, it's all taken together with a sterling silver square clasp. 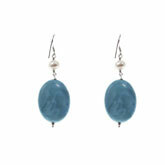 Lively blue turquoise and creamy white freshwater pearls make this versatile dangle a great choice for accessorizing just about any style. Wear it with designer jeans by day, or white silk dress by night. 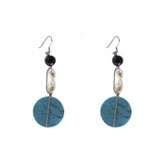 Shimmering faceted labradorite and turquoise combine for a cheerful look that's sure to please in our charming 3" dangle earrings. 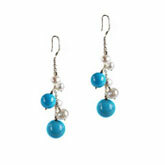 Round white pearls and round turquoise beads make a smashing combination in our 2.7" dangle earrings. So delicate, you'll never want to leave home without wearing them! 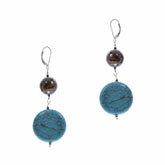 A kicky combination of faceted turquoise and freshwater cultured pearls in a 2.2" dangle earring. Fashionable, feminine and stylish! 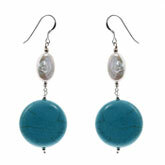 Creamy white coin pearls blend beautifully with turquoise in these delightful dangles. Silver ear wire. 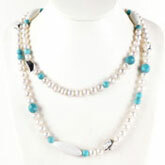 Our elegant 64" 4-strand tie-style white rice pearl and turquoise bead necklace truly makes a fashion statement. 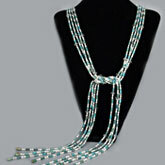 The Southwest design goes upscale with glittering crystal accents incorporated into each strand. Chunk meets elegance in this fun bracelet with crystalline blue rock, faceted amethyst beads and white freshwater cultured pearls. A real feast for the eyes! 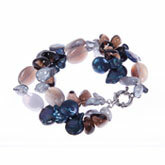 Feminine and bold at the same time, our freshwater pearl and blue ore bracelet looks fabulous with jeans or formal wear! A beautiful fashion statement. 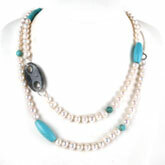 A classic design blending creamy white freshwater pearls with radiant turquoise. You'll show your fashion smarts by donning these at every opportunity! 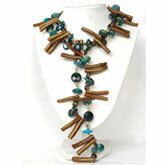 These beautiful baubles delightfully accessorize any outfit, regardless of occasion. 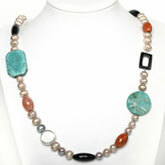 White pearls, black agate and turquoise combine beautifully for a versatile, stylish look. Fashionable 30" necklace composed of green turquoise, tympaniform black and variegated agate and chunky silver beads, strung with 9-10mm multicolor freshwater cultured pearls. An attractive fashion statement by day or by night. 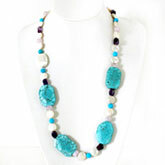 Our gorgeous 24" pearl, turquoise and amethyst necklace is a study in big, chunky contrasts. 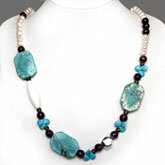 Interspersed between the white coin pearl are intensely blue turquoise beads, while at large chunky pieces of veined turquoise are accented by amethyst. A breathtaking piece. 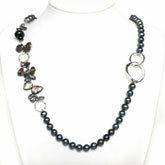 Take chunkiness to a new level with this breathtaking necklace that combines cool white pearl with amethyst and silver. 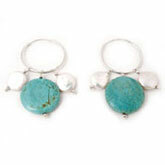 Large faceted turquoise beads bring a Southwest feel to this charming piece. 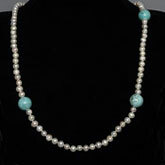 This single 30" opera-length strand of white pearls is a classical look made current with contrasting round turquoise beads. A lovely look when worn with a little black dress! Beautiful golden and multicolored freshwater rice and Baroque pearls combine with big chunks of turquoise and silver-toned beads to create a glowing look. A timeless double strand necklace! 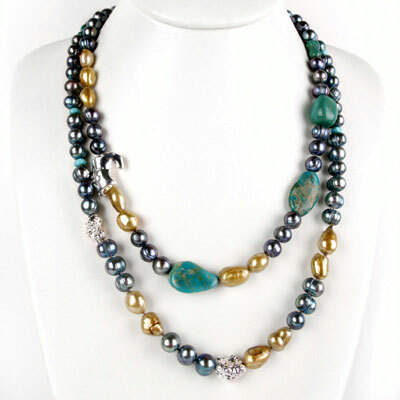 A lovely contrast of color headlines this necklace of beautiful round white freshwater pearls and deep blue turquoise. 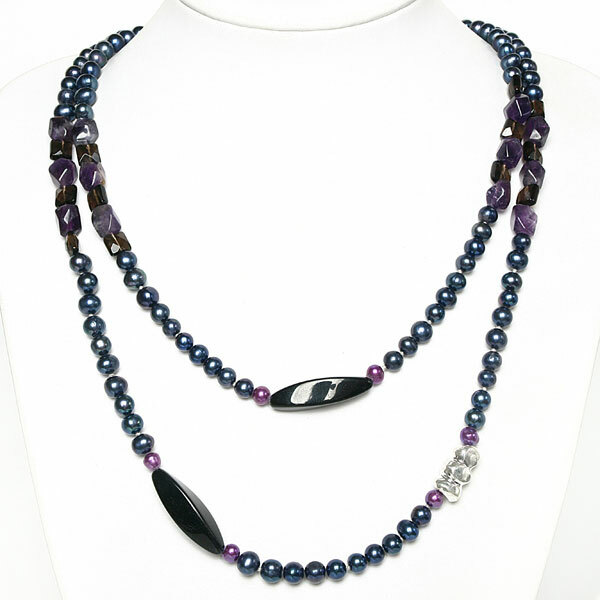 Deep tones of blue, purple and black form the color palette of this stunning 48" necklace. An absolute must for evening with that little black dress! 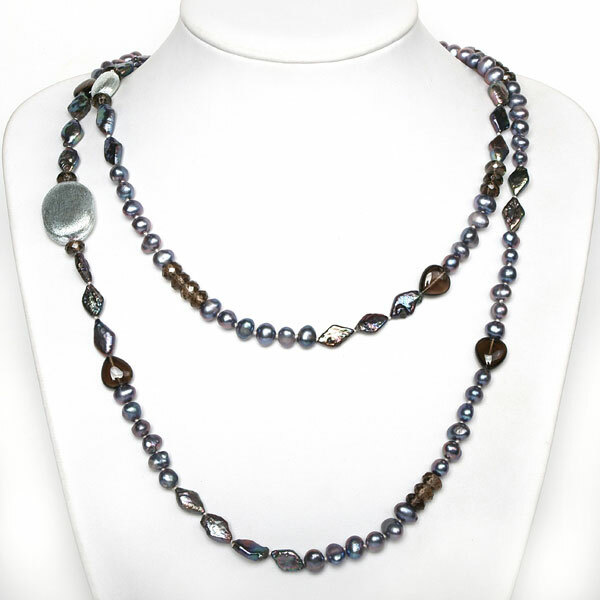 48 inches of blue pearls and smoky quartz span this luscious necklace. Diamond-shaped shell accent beads make this piece a real showstopper! A simple and elegant necklace of large white freshwater cultured pearls together with blue turquoise and white porcelain beads. Perfect for everyday wear - and a great value too!